A biotech ETF, a cash-gushing large-cap, and a dirt-cheap biopharma company top our list of great stocks to buy right now. The recent market downturn has created lots of bargains for healthcare-focused investors. So which stocks do our team of healthcare contributors think are great buys right now? We posed that very question to our team, and they called out the SPDR S&P Biotech ETF (NYSEMKT:XBI), AbbVie (NYSE:ABBV), and Jazz Pharmaceuticals (NASDAQ:JAZZ). Here's why. Brian Feroldi (SPDR S&P Biotech ETF): Major advances in biotechnology are unfolding before our eyes and promise to change healthcare forever. However, given the high failure rates of new drugs and technologies, it can be exceedingly difficult for investors to pick which companies will go on to be winners. That's why using biotechnology ETFs can be an easy way for investors to gain exposure to the growth in the industry. One of my favorites is the SPDR S&P Biotech ETF. The SPDR S&P Biotech ETF holds positions in about 122 different biotechnology companies of all different sizes. This includes many of the large-cap biotechnology companies such as Amgen and Gilead Sciences as well as a number of tiny ones like Amicus Therapeutics and Xencor. What's unique about this ETF is that it follows an equal-weight strategy. This means that it invests the exact same amount of capital in each of its holdings at the outset. The fund's holdings are then rebalanced every quarter to make sure any single holding doesn't get to be too large. So does this strategy work? Here's a great chart of this fund's performance when compared to the S&P 500. 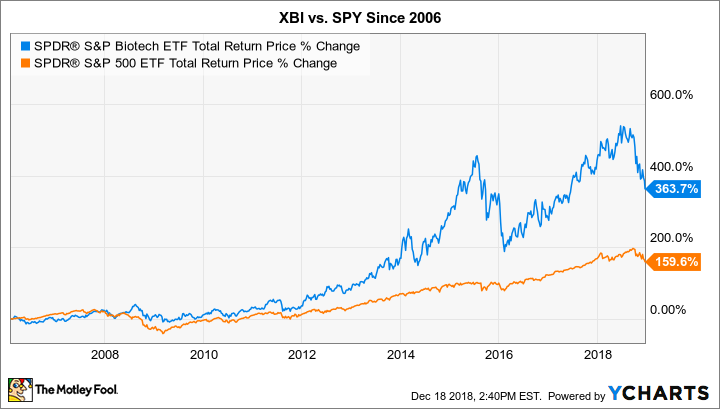 XBI Total Return Price data by YCharts. This chart makes me believe that it has created a winning formula that drives long-term success. What's more, the fund's expense ratio is just 0.35%, a completely reasonable price to pay. The biotechnology sector has been hit hard in the recent market downturn, so investors who buy today can get this ETF at a 27% discount from its recent high. That sounds like a bargain to me. Keith Speights (AbbVie): Probably the best equivalent to a trifecta in investing is finding a stock that provides solid income, great growth prospects, and an attractive valuation. There aren't many healthcare stocks that check off all three boxes. But AbbVie does. The big pharmaceutical company's dividend currently yields more than 4.5%. AbbVie has boosted its dividend by 140% since being spun off from parent Abbott Labs (NYSE:ABT) in 2013. AbbVie's growth prospects look very good also. Humira should be on course to remain the world's top-selling drug through 2024. Sure, biosimilar competition for Humira already exists in Europe and will threaten AbbVie's sales in the U.S. beginning in 2023. However, the company also has current big winners with cancer drugs Imbruvica and Venclexta, plus hepatitis C drug Mavyret. More important, AbbVie's pipeline includes several potential blockbusters that should propel revenue and earnings growth for years to come. Immunology drugs risankizumab and upadacitinib rank at the top of the list. AbbVie has experienced some pipeline setbacks, though, particularly with experimental cancer drug Rova-T. These have contributed to the stock's pullback in 2018. Shares now trade at less than 10 times expected earnings -- a bargain valuation, especially considering AbbVie's long-term growth opportunities and its rich dividend. You can find healthcare stocks with a higher yield than AbbVie, better growth prospects, and a lower valuation. But there's probably no other healthcare stock that provides an overall package better than AbbVie's. Sean Williams (Jazz Pharmaceuticals): When the stock market is correcting, sometimes the smartest move investors can make is to seek out value -- and there aren't many healthcare stocks offering better value right now than Ireland-based Jazz Pharmaceuticals. The big worry with Jazz Pharmaceuticals has always been its reliance on narcolepsy drug Xyrem, which comprised $357.3 million of the $469.4 million in sales during the third quarter. Xyrem has faced a number of potential generic challengers in recent years, and yet the company continues to maintain exclusivity over its lead drug. Jazz will go to bat legally, as well as settle with would-be generic entrants, in order to hang onto its cash-cow drug. Not to mention, Jazz has benefited from label expansion opportunities for Xyrem, as well as exceptionally strong pricing power for its lead therapy. Sales in the third quarter grew a robust 18% from the prior-year period. However, this could be a company that's about more than just Xyrem, even if it is the drug steering this proverbial ship. Since Vyxeos -- a treatment for certain types of acute myeloid leukemia with a poor prognosis -- was launched last year, this cancer drug has gained significant momentum. Following $9.7 million in sales during the third quarter of last year, Vyxeos racked up $21 million Q3 2018 sales and $75.2 million through the first nine months of the year. At scale, Vyxeos should climb above $200 million in full-year sales, which adds a nice complement to what Jazz is generating from its other high-margin, rare-disease therapies. Recently, Jazz's board also decided that it wasn't doing nearly enough for its shareholders. Having previously authorized a $640 million share repurchase program, which has been fully utilized by the company, Jazz's board increased its buyback program by another $400 million on Dec. 10. This should help lower the company's outstanding share count and provide a boost to EPS. Currently valued at just 10 times next year's estimated profit per share, but with projected compound annual EPS growth of 14.6% through 2021, Jazz looks to be quite the bargain for patient investors.